Metal Halide Light Fixture, Hazardous Location Fixture Type, Metal Halide Lamp Type, Lamp Quantity 1, Bulb Designation M135, Lamp Watts 400, Suggested Lamp Item No. 3JJ96, Fixture Wattage 400, Voltage 120/208/240/277VAC, No Lamp Included, Ambient Temp. 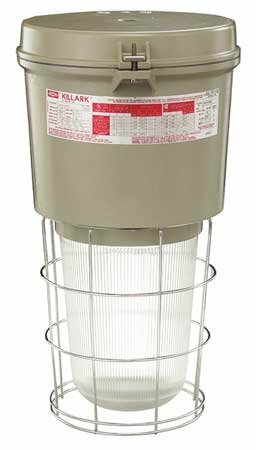 Range -40 Degrees F, Housing Material Copper-Free Aluminum, Tan Housing Finish, Pendant Mounting, Length 13-9/16 In., Height 9-9/16 In., Includes 2PDE6 Glass Globe And 2PDE7 Mounting Splice Box, Width 11-7/8 In. If you have any questions about this product by Killark, contact us by completing and submitting the form below. If you are looking for a specif part number, please include it with your message.